Let's face it: the internet changes so fast, no one individual or organization can keep up with it. It has become very confusing because there is simply too much information for a consumer to filter through when it comes to website design and maintenance. The reality of how quickly the internet changes has led XDevGroup to implement a new process for people and businesses to create and manage websites. We firmly believe that you should manage your own website's content, and we built software allowing you to do exactly that. Our software tool suite allows you to get your business on the internet in a fast, easy and cost-effective manner. You can manage your website from any computer with internet access and you don't have to install our software as it is all web-based. Our methodology is pretty simple: we build real world tools and applications for everyone to use. When we build more tools, we make them available for everyone as well. You simply pick the tools that apply to your business and we set up your website to use them. This approach allows us keep all of our clients up-to-date with new features because they all use the same software toolkit. 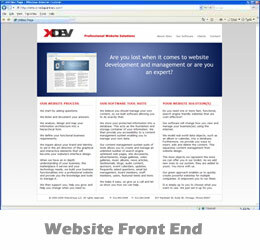 It also reduces the time of development and cost of our client's websites. We recognize that most websites have very similar features. We also know that all businesses ask for a simple way to update and display information on their website. We built our website content management system with this in mind. Our green approach allows us to recycle our content management system and quickly get your website live without paying developers a lot to build the features we already have. We analyze, design, and map your information architecture into a hierarchical form. 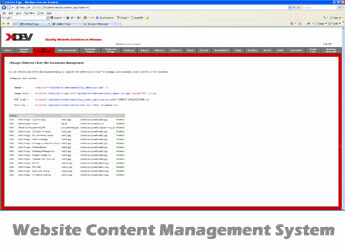 The list below contains some, but not all of our features available in our website content management system toolkit. As we add new tools to our system, we add them to everyone's system. FYI - Most of our websites have been built using only three of the tools listed below. It's not about how many you use, but how you use them. When we have an in-depth understanding of your business, the marketplace it serves, and your technology needs, we build your business functionalities into a professional website. We do this by combining your brand, identity, business requirements, the tools you selected from our toolkit, and the approved graphic design, on our website application. Once this step is completed, your website is ready to go. Finally, we provide you the knowledge and tools to manage your website by providing access to your administration console. We then support you, help you grow, and help you to change when you need. One of the best things about our system is that since we have so many clients using our software, we probably already have answers and examples to your questions when using our system. GIVE US A CHANCE TO HELP YOU. WE GIVE FREE QUOTES, JUST CALL US.